Not edited; just fair warning it was my first book my writing has gotten better. Just haven't re-did this book yet! I'm Zoey and I'm a fighter as my dad use to be too . Till one day he died and I took over . After losing him I continued to fight because of him and to prove that I can fight even if I have others whom I have to hide this from . Other consist of a badboy who's always in my way and he always shows off his badboy smirks . 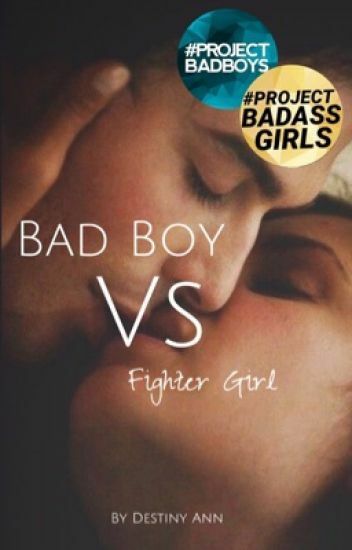 Read Bad Boy Vs Fighter Girl to find out if maybe this bad boy with smirks can figure out who zoey is ! Big shout out to @the_suburbs for making an amazing cover !!!!!! Blake Evans has more than just a rough past, she has the secret of being a bad girl. She is the good girl at school and bad girl after school. She gets good great: She gets high and drunk. She goes to class: She goes to parties. She steals the good girl reputation: she steals stuff and virginities. Life has become a monotonous routine for Aria and Xander. They became rival gangs long ago and have been at a stalemate that doesn't look like it will end. Becoming murderers at a young age causes a lot of trauma and regrets that are beginning to catch up with the both of them. And they begin finding comfort in each other rather than wanting to kill one another. But feelings are always complicated. Ryan Peter is a selectively mute girl, sort of. Also acting as a loner, when in reality she's full of sarcastic comments. She is also a fighter, a street fighter. Then she meets Lewis Black, resident bad boy of Jackson High, whom she adamantly spend most of high school trying to avoid. Lewis Black, what's there to say about him? Well as said before he's a bad boy. Also being the Alpha of the Black Water Pack. When he turn's 18 he meets Ryan Peter. But one question remains... Why is Ryan selectively mute? But have you ever thought of street fighting? CarlyAnne Spears, or Midnight as some know her, is the nerd of the school. She gets bullied but also gets straight A's. Her family is wealthy and Carly happens to be spoiled sick. Not that she wants to be, she hates being rich. That's where street fighting comes in. Zander Barns, or The Bar as some know him, is the badboy of the school. Every boy wants to be him and every girl wants to date him. He uses girls like tissues, once used, they get thrown away. He has much control over the school and fails every class, yet he doesn't really care. Zander also has a secret and to escape those secrets, he street fights. Nerd By Day, Street Fighter By Night. Caution- this is my first book and could possibly be really bad! I'm not the reader, so you tell me!! Another Caution- mature language and extreme, well I was going to say fighting, yet you probably wouldn't be reading this if you didn't want the action... Sooo, yeah! Scarlett Sage, a lost soul that turned to some night hobbies that aren't so legal. To be frank, Scarlett is a street fighter. Her opponents aren't only people though, but life itself. She is in a continuous battle with life, fighting for answers and to find who she is, more of what she is. Every night a reoccurring dream haunts her, but the second she lifts her head from that cushioned pillow, any memory of the nightmare is swept away except for those glowing scarlet eyes she can't seem to forget. Scarlett wants to sweep some parts of her life under the rug, including this dream, so when she turns 18 she takes her life into her own hands, ready for semi-independence from her dad Alex. Meet Jake Vance, a boy who has never had to lift his finger for anything or anyone. His hands are as soft as a baby's bum, with no callous present. He is the complete opposite of Scarlett, spoiled, not a hard worker, popular(envied by guys, loved by girls), and overall just a brat. To think he will one day be Alpha of a pack is quite worrisome with the way things look. But things always change. Nothing ever stays the same, and that's a promise. "Fighting Is all I have I'm not giving up even if I fall ill just keep getting up"   My name is Marianna and my father was a boxer and so am I after my father died in a boxing match I dedicated my life to him. People try to stop me, they say that ill end up like my father,but I don't care ill always be Fighter Girl. Everyone knows Shelly Summers as the schools typical nerd, with dorky glasses. Who wears lose shirts and sweatpants to school, tying her hair in a messy bun. What they don't know is, behind those dorky glasses and innocent eyes, lies a fighter. Then there is Chase Bones. The school's new bad boy. Known for his bad ways of getting things and the fights he gets in. But what happens when Chase ends up in the same place with Shelly? What will happen? Will the two very great fighters fall in love? Or will they become rivals? WARNING : This book is cliche AF and also stereotypical. I honestly didn't mean to offend anyone when I wrote this book. I was 13, so please excuse the mistakes. At a young age Violetta Bellissimo was a witness to her parents murder. Now she's been moved back to Italy after leaving America to live with her oldest relatives. There's only one thing she doesn't know, that she'd been lied to and compelled into a clueless world. With no real truth on who you are and being kidnapped for something you never even knew the answers to. Violetta meets the mafia leader and her secrets are spilled and her life exposed. The only thing is, she's a wanted girl to the murderers  of her parents and they'll do anything to have her even if she's forever sworn to the Italian. "Bone crusher, I know what bone you can crush this di- " I jabbed my right fist into his nose. I hear something break and he was down. I walked to Alex grabbed my money and left.Just because a girl who joins street fighting doesn't mean she doesn't know what she is doing.